You’ve got to cover your costs, but you also have to make sure you keep your expenses minimal so most women can attend. You may have money in your budget to cover some of the costs of your retreat. I’ve got some tips below, if you don’t. I’m going to list out what we’ve typically covered with our budget monies, what we’ve asked our women to cover, and expenses the church has incurred. Our retreat budget has varied between $1500 and $3000 depending upon the church and retreat location. Special publicity – postcards, custom flyers, etc. Free time activity costs, should they choose to shop, take a tour, etc. If I had my way, I’d charge between $75 and $90 (double occupancy) for a one night retreat. If you’re going to charge $90, you need to include 3 meals, a really nice goodie bag and/or t-shirt, and the accommodations should be 4 stars. I have paid/charged anywhere from $125 to $230 to attend a two night retreat. If I had my way, I’d charge between $150 and $200 for a two-night retreat. Again, at the high end, you need to include all meals, really nice lodgings, and evening activities. We charged $175 for double occupancy in a 3 bedroom oceanfront condo. We included 4 hotel meals (dinner was on your own Saturday night), tickets to a Christmas production, goodie bags, and a t-shirt. A note about scholarships: Partial scholarships were always available and donations to the scholarship fund were almost always solicited. Sometimes one woman would cover the bill for another. Even if women could pay very little, we asked them to do so – otherwise we found they were more likely to back out at the last minute, not realizing we were often going to have to pay for them anyway. I know some of you don’t have a women’s ministry budget. I also know $200 for a retreat would be unheard of at some of your churches. 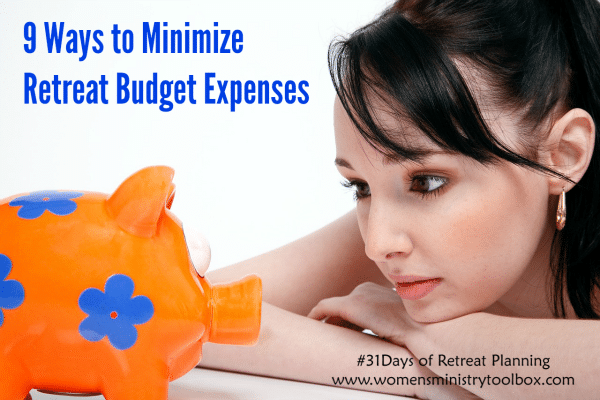 Minimize your lodging and food costs – church member’s rental home, Christian retreat center, etc. Hotel food can be terribly expensive. Prepare your own food if possible and stick to a strict budget. Bring your own tech equipment. Provide your own worship team, rather than hiring someone. Utilize your own women to speak and/or lead the sessions. You should still pay them an honorarium. Enlist your best budget-minded shoppers to help find stuff for goodie bags. Skip door prizes and give every woman a small favor instead. Make sure your women get plenty of heads-up that you’re going to have a retreat and encourage them to save a little every month. If you don’t know the final cost, give them a close estimate. As mentioned in my post on where you should have your retreat, negotiate and see if you can get the price down a little bit. Collect a deposit from your attendees before you have to finalize your room numbers with the hotel. If you’re going to be over budget, for whatever reason, let your Pastor know as soon as possible. Keep track of each and every expense. Make sure final payments are collected at least 1 week before your retreat date or earlier if you need to submit payment to your retreat facility. 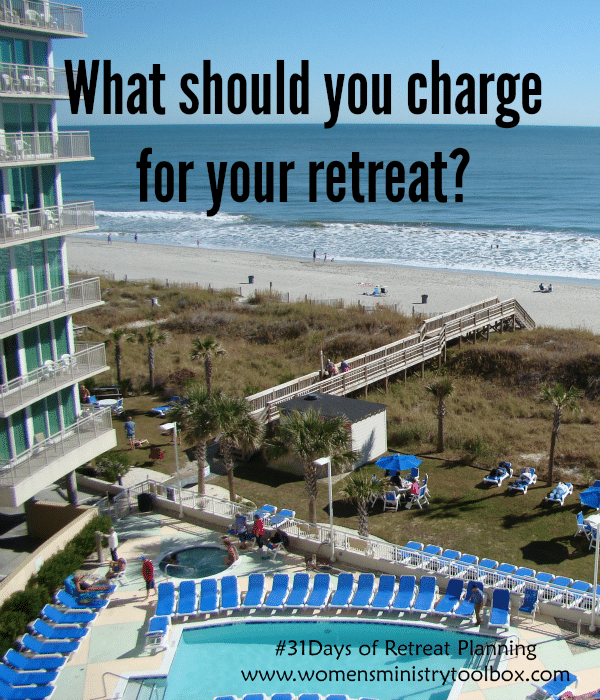 What other questions do you have about budgeting and retreat registration fees?